Sunday was the final day of the 2019 British Championships held in the Motorpoint Arena in Nottingham. With seniors and juniors performing their long programmes with only a few points between them after the short, competition was fierce to win the title of British Champion. 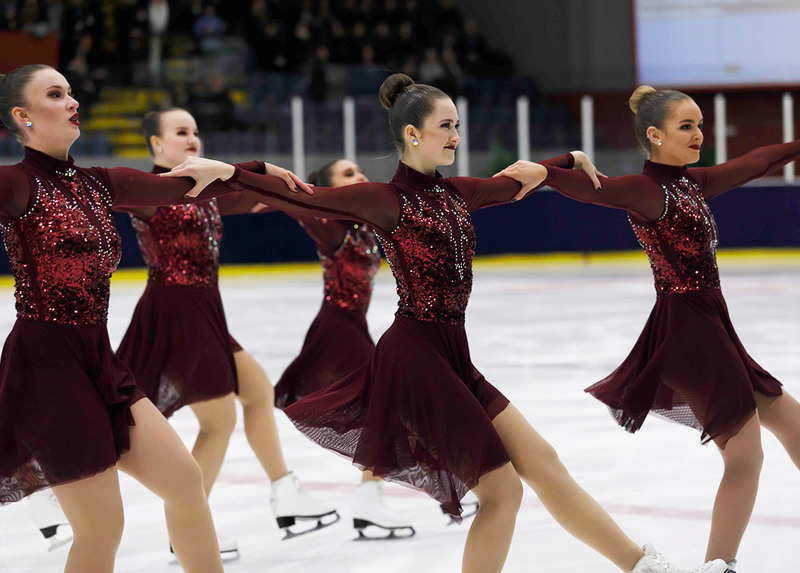 The free programmes were skated at the very end of the competition, ensuring a high audience turn out for the most anticipated event in the British Synchro calendar. The three senior teams went head to head for the second time this weekend. Icicles from Nottingham were second to skate with music from the Lion King and golden orange costumes to match. Their programme was fast paced and powerful even though they suffered a fall in a transition. They scored 78.07 points in their first outing of this programme, earning 119.56 points overall and winning them this year’s title of senior British Champions. Wight Jewels from Isle of Wight skated a carnival themed programme. It was upbeat and fast paced with interesting transitions although they had a fall in the twizzle element. Scoring 65.22 points, they came second, up from their third place in the short, with a combined score of 99.04 points. Zariba from Aberdeen skated to music from Moulin Rouge. In red dresses, they skated an elegant programme however they had trouble with one of their lifts. They scored 58.64 points, coming third with 94.39 points in total. Icicles from Nottingham skated to music from the Greatest Showman. This was popular music at this competition but their performance brought a new fire to the soundtrack. Highlights included synchronised cartwheels on the ice. They scored 69.26 points with a combined score of 113.25 points. Unopposed in this category, they will be the GB representatives at the Junior World Championships later this year. All Stars from Slough were the only competitors in this category. They skated in blue sparkly dresses but suffered a fall early on in the programme scoring 44.45 points with a combined score of 70.45 points. In first place scoring 68.68 points was Solway Stars from Dumfries. Skating to music from the film Moana, they wowed the crowd with their smooth, soft skating skills. They scored 108.36 points altogether. In second place with 52.90 points were Whizz Kids from Altrincham. They skated to music from the Greatest Showman in a very energetic and entertaining programme. They had a total score of 84.17 points. In third place was Unum from Sheffield. They came 4th in the short programme but made up their 49.93 points skating to Dance Macabre with some quirky choreography. They scored 70.35 points in total. The only team in this category was Ice Dreams from Nottingham. 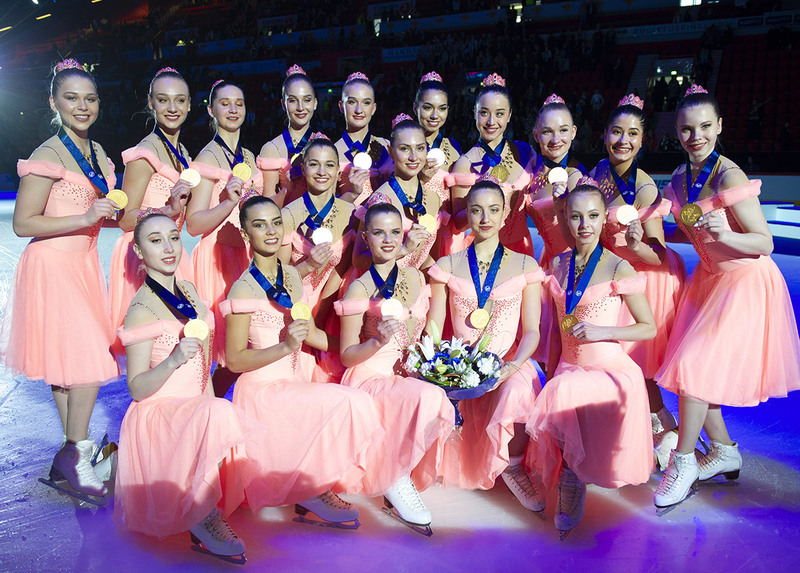 They skated in blue flowing dresses a very confident programme scoring 52.01 points. This was a popular category with 10 teams competing. Winning the gold medal was Aura from Lee Valley. They skated a haunting programme with sparkly ombré grey dresses scoring 43.44 points - a huge improvement from their last competition. Earning the silver medal was Solway Eclipse from Dumfries. Unfortunately they suffered a fall in their travelling wheel and narrowly missed winning, scoring 43.12 points. The bronze medal was taken by Ice Unite from Nottingham. They skated an upbeat number but had a fall with an interruption in excess deduction so scored 37.88 points. Ice Stars from Nottingham won this category, even with a fall in their creative element, scoring 28.82. Skating to Spice Girls with multicoloured dresses, Wight Sparkles from Isle of Wight came second with 21.83 points. In a category consisting of 10 teams, Phoenix from Lee Valley came first. They skated a feisty programme to Lady Gaga, scoring 39.61 points. In second place was Deelites from Deeside with a mature programme in red lace dresses. They scored 35.21 points. In third place was Solway Lightning from Dumfries, scoring 35.08 points. In the Adult division, Starlight Rain earned the gold medal with a total of 23.65. Bladerunners from Altrincham claimed the silver (23.05) and Ice Diamonds received the bronze with a score of 21.94. Thirteen teams competed in this category. The live-streaming and commentary of the British Championships this year was provided by NISA for BBC sport and BBC iPlayer. Not only has this enabled people who cannot travel to the Championships to watch it, it also will enable the competing skaters and coaches to watch the event in its entirety. Special mention to Chris Buchanan and Sam Ozard for providing us with superb commentary throughout the event. Hopefully this can be seen at other synchronised skating competitions in the future!